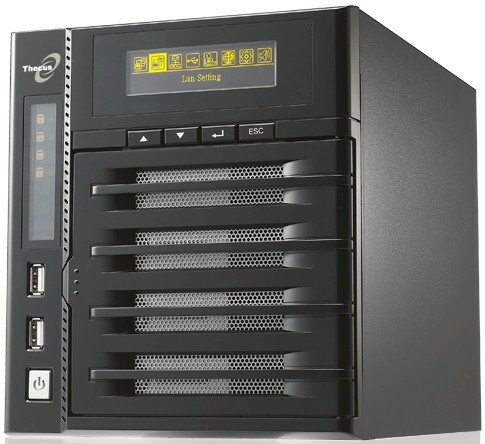 Summary D525 Atom-based four-drive BYOD NAS with built-in battery backup supporting multiple volumes, EXT4, EXT3, ZFS or XFS filesystems and iSCSI initiator / target. The N4200PRO is an N4200 with an Intel D525 Atom CPU vs. the D510 in the original N4200, which I looked at almost a year ago. Aside from the CPU change and a newer version of firmware, the two products are the same. So hit that link above if you need functional details. There is also on online emulator you can test drive. Like the N4200, the 4200PRO also has a built-in backup battery that Thecus calls a "Mini-UPS", which allows for an automatic orderly shutdown when power fails. It's still not documented in the latest (V6.3) user manual, though. Oddly, there is no mention in either the User Manual or website of the 4200PRO's support of Thecus' optional CU30N PCI-e card that can add two USB 3.0 ports via the single built-in PCI-e slot. I didn't have any luck getting the N4200 to recognize a 1 TB WD MyBook 3.0 drive. But since Thecus didn't include the USB 3.0 port card with the N4200PRO, I couldn't see whether they fixed the problem. Thecus supplied the N4200PRO with four 160 GB WD Caviar Blue drives (WD1600AAJS) for testing. They brought total power consumption with all drives spun up to 54 W and 22 W with the drives spun down via the programmable idle drive power save feature. I rated noise as medium low. The low hum of the four drives was audible in my quiet home office, but there was little fan noise, even under the tests imposed by our benchmark tests. I saw a few changes in the 5.01.04 firmware worth noting. First is the addition of EXT4 to EXT3, XFS, and ZFS for available volume formats. EXT4 is now set as the default. I also spied Transmission, Piczza (photo serving), Webdisk (web file management) and Dashboard (iOS remote admin client) as additions to the installable module list. The N4200PRO was tested with 5.01.04 firmware using our NAS test process. The Benchmark summary (Figure 2) is a bit odd in that it shows NASPT write tests for RAID 0, 5 and 10 volumes were much higher than their Windows File Copy counterparts with all coming in above 100 MB/s. Still, the 90 MB/s Windows File copy results weren't too shabby either. iSCSI target write performance to target created on a RAID 5 volume came in at 93 MB/s, but read was only 59 MB/s. I downloaded and installed Thecus' USBCopy module to run backup tests with our standard Iomega UltraMax Pro Desktop Hard Drive. Since Thecus doesn't provide a way to format external drives, I was able to test only FAT and NTFS backup formats with the Iomega drive connected via USB 2.0 and eSATA. Best backup throughput of 48 MB/s was obtained with FAT format and eSATA connection. Rsync backup to the NAS Testbed running DeltaCopy acting as an rsync target of 39 MB/s was slightly better than the 35 MB/s measured with the N4200. For a competitive look, I ran RAID 5 File Copy charts filtered for four-drive NASes. The N4200PRO fares pretty well for RAID 5 write (Figure 3) at 93 MB/s vs. the N4200 at 76 MB/s. The 4200PRO's ranking and margin above the 4200 is lower for RAID 5 reads at 90 MB/s vs. 76 MB/s. For reference, the only other D525 Atom based NAS shown is the QNAP TS-459 Pro+. So for RAID 5 read, the 4200PRO is betting beat by some D510-based boxes like the Synology DS411+ and NETGEAR ReadyNAS Ultra4. The Atom D525 in the N4200PRO provides a definite performance boost over the D510 in the N4200. And if you shop carefully, you can get the PRO for only around $50 more. Synology's DS411+ provides a compelling alternative, though, if you're willing to live without hot-swappable drives.